I really liked this one … and then I didn’t. Henry Kyllo is a Runner … a member of a secret society that runs information to and from different locations. But Runners have to pass through a city filled with Hunters. The Hunters shoot the Runners. The Runners fill up with the lead from the Hunters’ guns. The hope – the dream – of the Runners is to fill with enough lead that they reach Ascendency – to become a perfect machine. And how much lead will that entail? How does a Runner finally reach this pinnacle? Well, no one really knows – it hasn’t happened to anyone before. Is it possible that Ascendancy is just a dream to keep the Runners going? But Henry does get enough lead to transform into the perfect machine. He is supported by his girlfriend and by his best friend Milo – now a ghost as he had his head cut off (clearly the best way to stop a Runner since they absorb the lead from the guns). I enjoyed author Brett Savory’s writing style, which was energetic and quick. This is an easy, light read and the personality of the characters and the book itself was ‘polite’ – which is an odd thing to say about a story, I know. But given that people are shooting at one another, beheading them, and violence seems to run rampant, this never felt like a gritty, post-apocalyptic style story, even though the general setting made it seem like it ought to be such. And that’s okay. I actually really enjoy these kinds of contradictions in the things I’m reading. In fact, it was rather a relief to read something that wasn’t just a copy of everything else set in a post-apocalyptic future. But what wasn’t okay was the lack of actual story. What Savory has done is presented us with a series of interesting images, all described well, so that we can picture them ourselves, with some interesting basic characters. But the characters never develop and the story doesn’t seem to go anywhere with any purpose. Savory is fun to read, but this story isn’t. Looking for a good book? 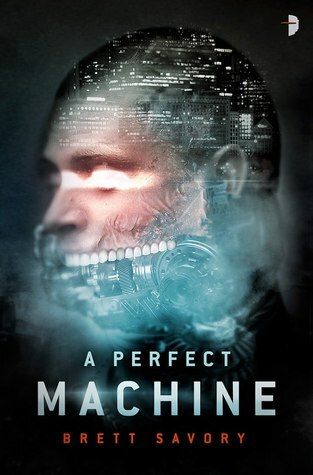 A Perfect Machine by Brett Savory is a sci-fi thriller with a strange mix of supernatural and bizarre presented quite pleasantly.